The food choices you make every day directly affect how your body functions. Make the right choices and you’ll thrive. Make the wrong ones and you’ll be sick, tired, and overweight. In the last few decades, we’ve witnessed just how closely our health and food choices are linked. The rise of ultra-processed food-like products has created health problems that were virtually nonexistent in the past. In just the last 40 years, the rates of obesity in children and adolescents have increased tenfold[*]. This unprecedented hike is happening because traditional cuisines are being replaced by convenient junk and processed foods in all corners of the world. People have more access to harmful food than ever before. This is something that today’s guest, Vivica Menegaz, knows first-hand. 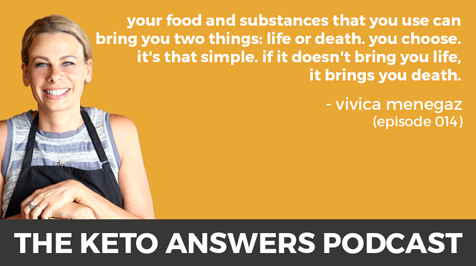 Vivica is a nutritionist, cookbook author, keto blogger, and former professional food photographer. She grew up in Piedmont, Italy, where she learned about food, health, and cooking from a young age. In Italy, the cuisines of different regions are extremely local and seasonal. Since Piedmont is a mountainous area, her family only cooked food that grows and lives on the mountain: river fish, wild meats, mushrooms. Eating fried cow brains was commonplace. It wasn’t until Vivica moved out of Italy, to different parts of Europe and then America, that she noticed the stark contrast between traditional, local cuisine and the nutrient-poor, calorie-dense food culture in America. That’s one of the reasons she decided to become a nutritionist and help people heal by teaching them how to make better food choices. In today’s episode, Vivica explains why it’s paramount to your health to focus on high-quality foods, how to reconnect with real food and not get overwhelmed by cooking, and why detoxing is actually necessary (when done right).